• Live Bait is reimbursed on this trips, varies due to seasons. 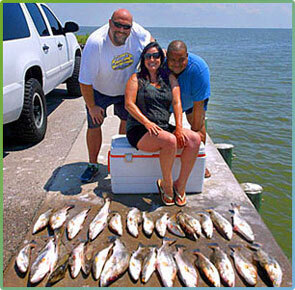 For your convenience Galveston Fishing Guides Topp Dogg Fishing Guides accepts all major credit cards. You can pay your $100.00 deposit or your trip rate balance. This website has a SSL Certificate which makes it a secure site. PayPal is easy, safe and also secure. Additional charge for live bait can be paid on the day of your fishing trip. If you enjoy your fishing experience and you decide to give a gratuity, that can also be given to your Captain at the end of your fishing trip. A 3% service charge for all deposits, payments and refunds will apply. • A $100.00 Deposit is required for every trip or each boat reserved. • Speckled Trout and Redfish Half Day fishing trips last about 5 1/2 - 6 hours. • Full Day fishing trips last around 8 hours, add $100.00. • Call for quotes for Tournament rates and Galveston Bay fishing classes. • Multi-Party boat trips or corporate tournaments are available with notice. • Any gratuities are greatly appreciated by both Captains. • Your Captain reserves the right to cancel any fishing trip due to unsafe weather conditions. • Your deposit is only refundable if the trip has to be canceled due to bad weather. It can be used towards rescheduling another trip, but CANNOT be refunded for any other reason, even with advanced notice. • Try to be on time. The morning bite is usually very productive especially for speckled trout. Plus your Captain needs to get to that certain spot first. • Listen to your fishing guide. Capt. Alan or Capt. Steven will help you catch more fish by teaching you the proper techniques to use. • Remember every guided fishing trip is different - Be safe, catch fish, have fun and enjoy your fishing experience.